Harley-Davidson’s dealer-led Dark Custom customisation competition returns for a fourth year. Online voting is now open. Harley-Davidson’s ‘Battle of the Kings’ 2018 customisation contest now moves up a gear with the opening of the Battle of the Kings (BOTK) online hub for motorcycle fans to vote for their favourite entry from official Harley-Davidson® dealers across 21 countries – including 15 from across the UK and Ireland. This follows a successful Grand Reveal event of this year’s entries at Harley-Davidson dealerships participating in Battle of the Kings 2018, on Saturday, January 13. 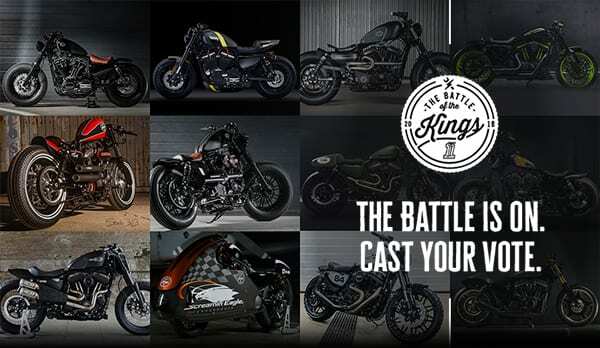 The Harley-Davidson Battle of the Kings competition is now in its fourth year and leads the way in dealer-led customisation. This original and biggest dealer-based competition showcases the wealth of in-house custom talent and the extensive range of Harley-Davidson Dark Custom® parts and accessories readily available to support customisation requirements of Harley-Davidson customers. With the opening of the 2018 BOTK voting hub, motorcycle fans can vote online for their favourite entry. For the UK & Ireland, these votes will generate a shortlist of five entries to be judged by an exclusive panel of guest judges in order to select the overall winner. The lucky finalist will then go head-to-head against other regional finalists at a Grand Final to take place at Milan’s EICMA exhibition in November 2018. The UK & Ireland round of judging will take place at The Carole Nash MCN London Motorcycle Show, February 16-18.